H.B.S. has been working with impact-resistant products and meeting the highest standards of hurricane code approval since the inception of the Dade County Impact Code in 1997. Our staff are experts in interpreting the Florida Building Code, and all of our products are tested and approved according to Miami-Dade County or SBCCI standards. We also offer window and door repair, replacement, service, and installation. Our engineering experience means that we can provide structural modifications or adaptations necessary to provide a safe and beautiful product for our customers with custom applications. 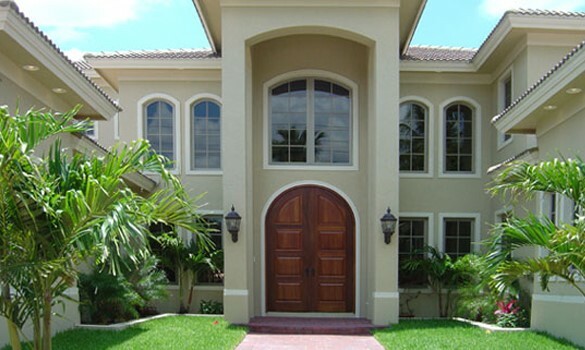 We have more than 30 years of experience in new construction installation of windows and doors in the Vero Beach, FL area, as well as remodeling and retrofit applications. We employ only qualified, experienced estimators to completely review our projects for code compliance and produce accurate and honest proposals. Our windows installers are experts in code-approved product installation. This is important because impact-resistant products have to be exactly positioned and meet stringent fastening criteria. To that end, we use high-tech laser equipment for window and door alignment to assure everything fits perfectly. To facilitate the final inspection process, we pre-inspect our own products and installation, as well as waterproof our own windows and provide bucking services. We bring our engineering knowledge to every job we do, meaning we can often create innovative products or find solutions that would evade other installers. You can count on the fact that our products go beyond what you can buy off-the-shelf—and our deep knowledge of code requirements means we can make modifications or adaptations as necessary to ensure your finished product is as safe as it is beautiful. The staff at H.B.S., Inc. has been installing replacement windows and doors in homes since 1976. We use our own licensed and insured installation crews that are full-time employees of H.B.S. Our crews are motivated to do the job right, no matter how detailed the installation, because our business reputation is on the line with each window that we install. H.B.S. has a far different philosophy from the larger home stores that subcontract the labor to independent “pieceworkers.” These pieceworkers are motivated to install as many windows as possible in the shortest amount of time to maximize their labor profit. This is a very bad arrangement for the homeowner. He or she has just been sent on a blind date with an installation crew that is only motivated to finish the project as quickly as possible. This subcontracted relationship is the breeding ground for shortcuts and the “can’t see it from my house” attitude toward quality. Remember, even the best windows and doors will only perform as well as their installation. One of the most noticeable improvements that you can make to your home is to replace your old worn-out windows with new high-performance windows. Window technology has improved dramatically in the past 20 years. We now have the technology to produce high-performance windows that are more energy-efficient, water-resistant, impact-resistant, and have architectural details that enhance the appearance of your home. All Florida insurance providers require impact protection of all glazed openings to qualify for additional insurance discounts and lower deductibles. We offer products made from wood, aluminum and vinyl. Our professional staff is available to help you choose the best products for your application. A highly experienced sales consultant visits your home to discuss your needs and make some recommendations for your project application. We take detailed measurements of the products to be replaced. You visit our showroom to see actual window and door displays and review performance specifications. Our knowledgeable staff help you choose the best product for your home. We send an honest and detailed proposal which describes all items to be replaced. The proposal will also define any special job conditions or additional services that may need to be addressed by the homeowner. Selecting the right product for your new construction or remodeling project in Southern Florida is more than a matter of style. It also involves quality, efficiency, and value received. HBS will help you from the selection process through the completion of all your window, door, custom mirror and shower door installations. Looking for references and credentials? Read some of our testimonials or just take a look at some of the jobs we have done! And if you’re ready to learn more about what HBS can do for you, contact us now or give us a call at (772) 567-7461. 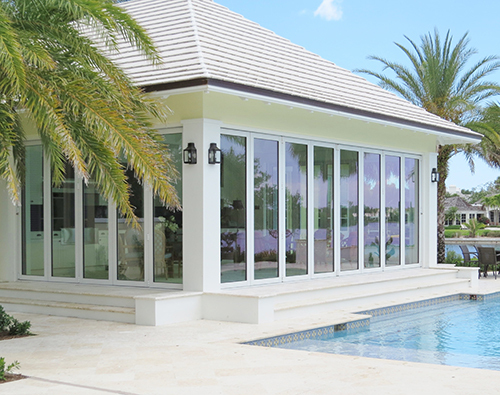 HBS sells and professionally installs top-performing, impact-resistant windows and doors in Southern Florida, designed to meet the highest standards of hurricane code approval.